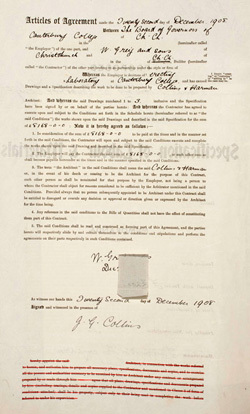 A contract between the firm of Collins and Harman, and Canterbury College, 1908. All images used on this site are copyright to the University of Canterbury. Material on the University of Canterbury (UC) web pages may not be copied, distributed, or used for commercial purposes without the prior, express written permission of UC. If you would like to obtain copies of any images used on this site, you can download the credits for the Illustrations (PDF, 131KB), which lists all the illustrations used in this exhibition along with their Library reference numbers. You may also find it useful to search our collections online using Digital Library. The Library is able to provide images for personal use, private research and study, and commercial purposes. There is a copy fee for this service. Clients must also formally request to use images for purposes other than private research and study. At the discretion of the Library, a reproduction fee may be charged. Generally, a reproduction fee is only charged when an image is used commercially. The 1994 New Zealand Copyright Act applies to all images in the collection, and it is the responsibility of the user to comply with copyright regulations. All requests for copying and reproduction must be completed using the appropriate forms which are available from the Macmillan Brown Library.